How do I use Lingopolo to learn a language? What is the teaching method of Lingopolo? What is the pedagogical basis of Lingopolo? Are the recordings of real people? Can I use the recordings for something else? What is the copyright? What are the different types of quiz question? What are the Examples of a word in use? How do I switch off the high-score sound? How exactly does this spaced repetition system work? How many recordings are there? 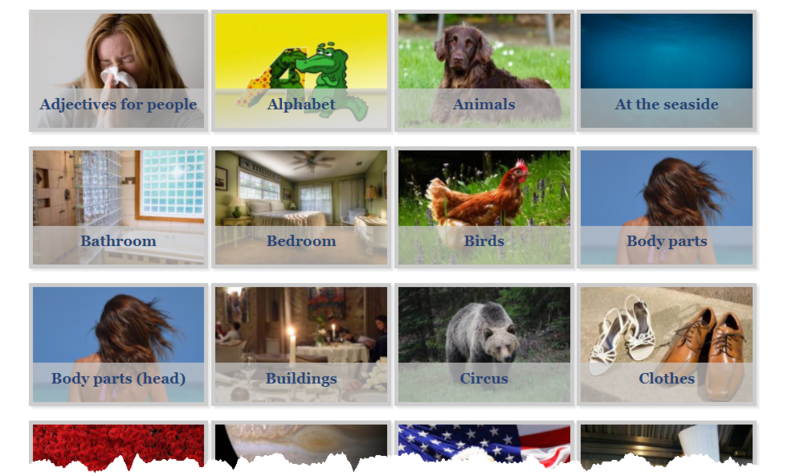 Lingopolo is a free website designed to teach you to understand and speak languages. It does this through online lessons taught through quizzes. 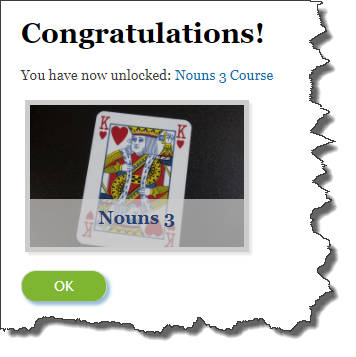 When you complete a particular course, you are rewarded with the next course being unlocked. Lingopolo organises lessons into sets of words, and trains you to understand these words by quizzing you with flashcards. Each quiz consists of 10 words. At the start of each quiz, you will be shown your current knowledge of the set of words, and at the end of each quiz, you will be shown your new knowledge level. The idea is that you move each set of words along from having a starting knowledge of 0% to the point where for each set you have a knowledge of 100%. The best place to start is to always follow the automatic recommended lesson. This will be found on the Online Lessons tab. 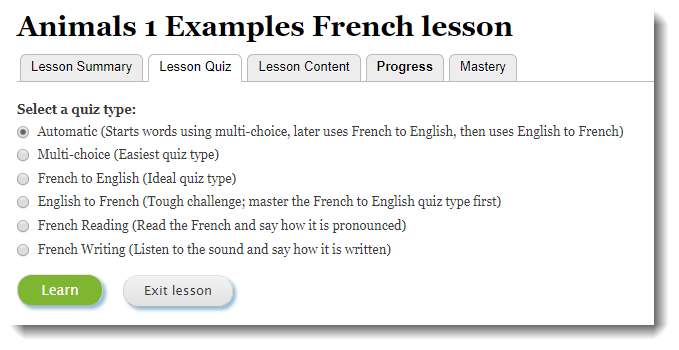 You can simply click on the recommended lesson green Learn button and begin. 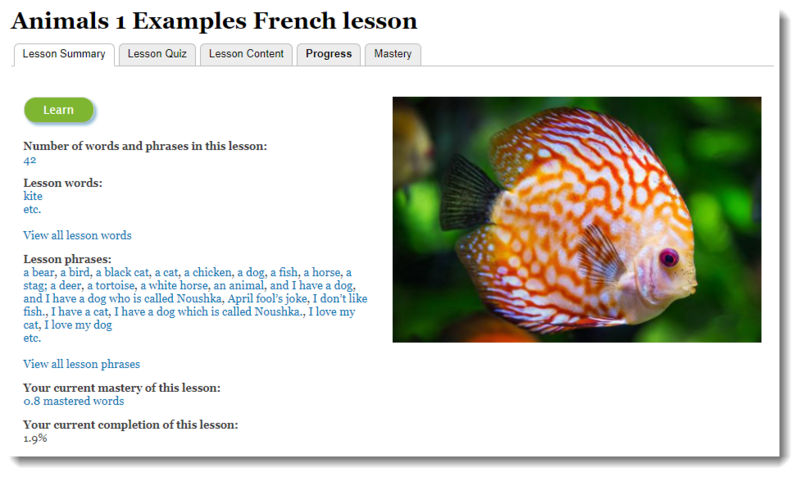 The Recommended lessons will always be displayed on the Online Lessons page, and at the end of every quiz. It will automatically adapt to where you are in your language learning, so it will always show you the best lesson to be studying at your current level. An alternative, and also good, is to go to the list of Themed courses, and pick a theme which interests you and to follow the recommended lesson for that theme. For example, if you wanted to learn Clothes you would go to the Clothes course and you will see it recommends for you to do the Clothes 1 lesson. 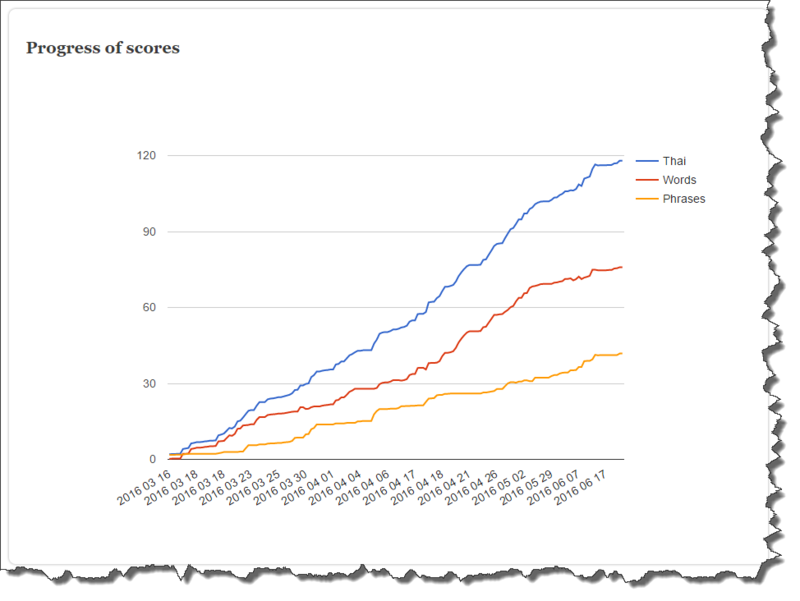 One thing to realise, is that as long as the Mastery (High) Scores displayed at the top of the page are going up, then you are improving. In fact, it doesn't really matter which order you choose to study, as long as you are progressing. If these scores are going up, then you are progressing. The recommended lessons will take you on the normal route through the material, but if you choose to plot your own course, that's OK too. teaching you to understand a gradually more and more complex body of comprehensible input. This means that Lingopolo starts teaching you very simple words and phrases, and gradually moves to more and more complex words and phrases. The aim is to always challenge you, but never to lose you. teaching you from the most common words to the least common words, in order to maximise effectiveness. Every lesson is carefully arranged to make sure that you learn the most frequently used words first. requiring you to use active comprehension, rather than passive comprehension. We constantly use question and answer to ensure that you are always paying attention. Our skill focus on Lingopolo is on listening and getting you to understand what you hear spoken, and when you can understand what is being spoken, getting you to speak. When you can understand what is being said by someone else, it is much easier to be able to say these things yourself. We build up your language comprehension skills naturally by building up sentences in a pyramid-like way. For example, first you might learn to understand some nouns (e.g. 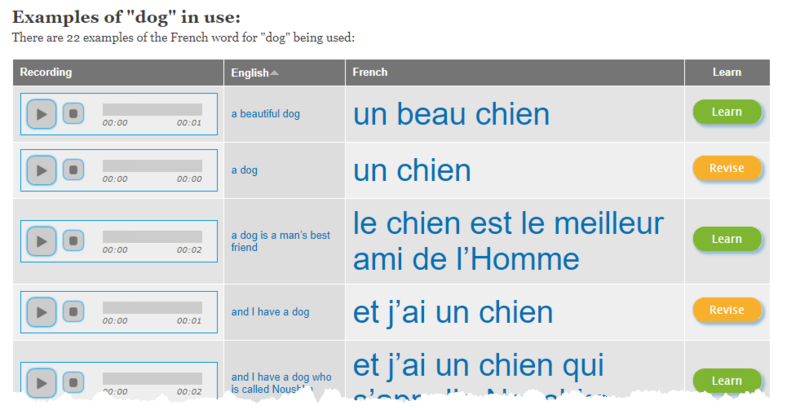 "man", "woman", "dog", "banana", "two"), then you learn to understand some verbs (e.g. "to like", "to eat"), and then we very quickly start putting them together into simple phrases like "The man likes the dog", "The woman eats two bananas". Our emphasis here is not on forcing you to speak before you are ready, but on making sure that you understand what is spoken, that you are learning to process language in a very natural way. listening. We make the listening skill (and of course comprehending what is said), the fundamental platform upon which each of the other skills are built. This is the most effective way to ensure that you develop a good accent when you speak. speaking. Once we are sure you can understand a word or phrase, then, and only then, do we ask you to speak it. This ensures that you at least have a good basis in your head for how a word or phrase sounds before trying to say it. reading. Before reading a word or phrase, we prefer that you can recognise it when it is spoken (the listening phase), and that you can reproduce it when speaking (the speaking phase). Then, and only then, do we suggest you learn to read it. This ensures that you use just your ears and mouth (and not your eyes) during the listening and speaking phase. When you speak, the aim should always be to reproduce what you hear spoken, and not what you see written. writing. Finally, when you can properly read a word, then, and only then, do we teach you to write it. It should be remembered that this sequence of listening, then speaking, then reading, then writing is the way in which children learn their own language. Lingopolo is based on the method which the world's leading language organisation, SIL, uses for their staff to learn languages with one-on-one language helpers. SIL are the leading experts on world linguistics. It is SIL who are the authors of the Ethnologue, the definitive guide to the world's languages. It is an aural method based on the principle of learning increasingly complex comprehensible input. It is very closely related to Stephen Krashen's Theory of Language Acquisition. Yes, all the recordings are made by real people, who are all native speakers of the language. All recordings, unless otherwise specified, are licensed under a Creative Commons Attribution-NonCommercial-ShareAlike 4.0 International License. See the copyright information page for more details. 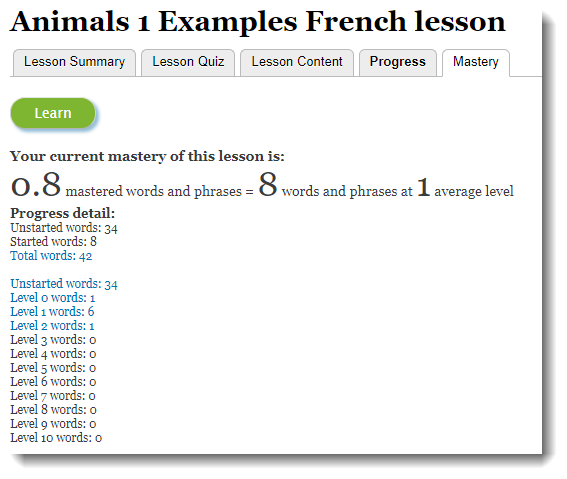 A lesson is a collection of words or phrases which you can practise using quizzes. A lesson can be on subjects from food to Thai consonants. A lesson can have just a few words, such as the days of the week or have absolutely hundreds of words like the vocabulary lesson. 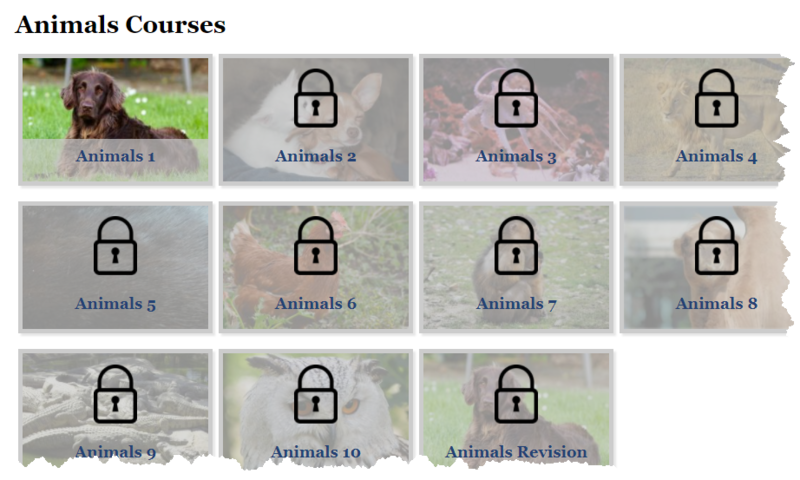 A lesson can be on a particular theme, such as the colours or parts of the body; for a complete list of themed lessons, see the Themed lessons page. A lesson can be grouped by part-of-speech, so for example there is a lesson on nouns and a lesson on verbs. This can be useful if, say, you feel you you are lacking a particular type of word. The full range of these lessons can be found on the lessons page. In addition to the lessons described above, we also have some special lessons. The most important of these is the words lesson; this is the perfect lesson for revision of all the words on this site. It is the ultimate practise tool for all of the words. It will very quickly hone in on those words which you find difficult and keep getting wrong, and will keep asking you until you are fluent! Finally, there is the phrases lesson; this is not something for the beginner, since it puts together the words from each of the other lessons. We therefore recommend you study the words lessons first, and that you first study the phrases in the context of one of the traditional lessons above. However, when you’re ready, this is an excellent lesson to really challenge and stretch your Thai. Every lesson has exactly the same structure, so you should soon feel comfortable finding your way around a lesson. 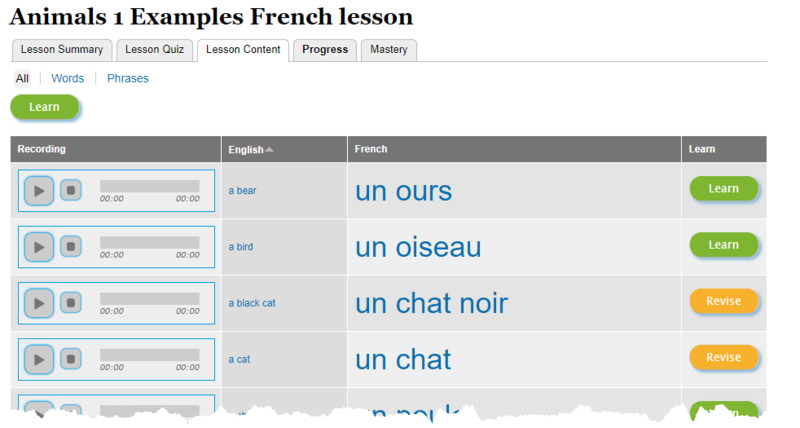 A quiz consists of up to 10 questions taken from a particular lesson, and is the main way in which Lingopolo teaches you the words and phrases. 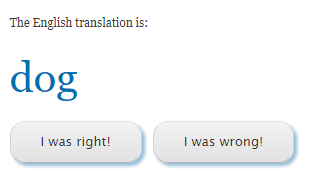 Each question in the quiz is scored either right or wrong. 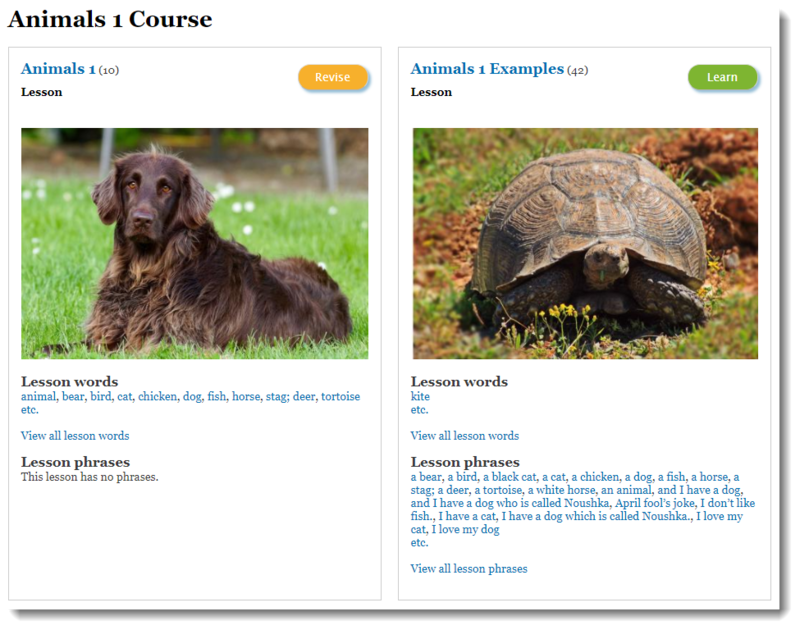 For example, in the lesson on animals, there are currently 20 words. A quiz will ask you 10 questions, using some of these 20 words. Depending on how much you have already studied this lesson, and whether you keep getting the words correct or not, the ten questions may be ten different words from this lesson, or, more likely (if you are getting words wrong), a smaller number of words with some of those that you get wrong repeated. At the end of the quiz, you will be shown your results for the quiz. You can choose the type of quiz question which you are given from the Quiz tab. Each quiz type has its own special characteristics, so its good to have a full understanding of each. By default, the quiz type is set to Automatic. In general, this is the best quiz type to have selected, as it will select for each word or phrase the best type of quiz question depending on your current knowledge. When you don't know a word yet, it will ask you with a multi-choice question. As you get better at that word or phrase, it will then ask you from the language you are studying into your own language (e.g. French to English). Finally, when you know the word or phrase very well, it will ask you with the hardest question type of all, which is from your own language into the language you are learning (e.g. English to French). Note that with the Automatic quiz type selected, the question type for a word or phrase will change to be easier or harder, depending on how well you have done in the past. If you get a word right, the question type will become harder, but also, if you get a word wrong, the question type will become easier. For example, if you are asked a word from your language to the language you are studying, and you get the word or phrase wrong, the next time you are asked it will start again by asking you a multi-choice question. 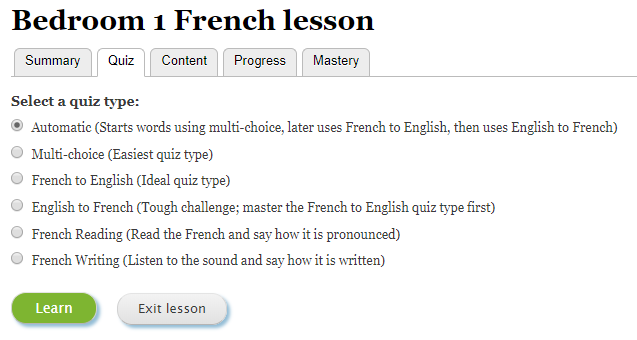 We strongly recommend that, at least to begin with, you leave the quiz type as Automatic. In a multi-choice quiz, you are give a selection of 5 answers to choose from. This is the easiest type of quiz, since you can just pick the one which you think is correct. Often, you may not be completely sure which is the correct answer, but you may at least know some of the answers which are not correct. Here, by French to English, we mean from the language you are learning, into your own language, so instead of French, this might be Thai or Dutch. This is the best quiz to practice your listening skills, since you will hear your target language spoken, and you will have to know what the person is saying. In this question type, you will simply hear a recording of the word or phrase, and you will have to see if you understand it. The next style quiz is from English (or your own language) into French (or whatever your target language is, which might be Thai or Dutch). This is the quiz type which is designed to test your speaking ability. You will see here that you are just prompted with the English word (or phrase) and you have to know how to say it in the target language. This is exactly the skill you need when you are speaking in a language; you know what you want to say, and you have to pull from your brain the right word, or words, including the right word order, the right forms of the words, and of course the right pronunciation. Although it might seem like you cannot mark yourself correct or not, in fact, this works very well. Most of the time you will know the word or phrase (in which case you were right), or have no idea (in which case you were wrong). In the case of pronunciation, you will gradually train your hearing to better and better be able to say whether you were saying the right thing or not. Wherever possible, every word has examples of its use in phrases. 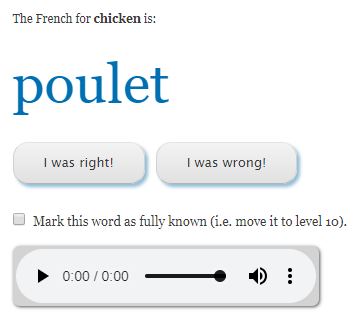 Each of these phrases are also in Lingopolo, so you can click on the phrase to browse in more detail, or click on the Learn button to practice just that phrase. When you reach a high score, a little ping sound is heard and the related high-score(s) briefly flashes. If you would like, you can turn off this sound in your profile. To do this, first click on My account. 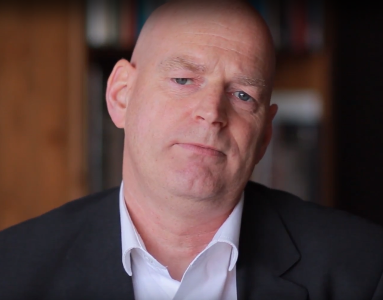 Hello, my name is Hugh, and I am the founder and original creator of Lingopolo. I was working as a software developer of websites, but also I was a student of Thai; this website began as the combination of those two things. Many of the Thai recordings are taken simply from my real lessons with my teachers. I am still a large user of the website, using it for my own language study, and changing the website to be the language website that I want. I have been doing software development for most of my working life. I have worked for many of the worlds biggest companies including IBM, Microsoft, Sony and AIG. I worked at the European Commission as an IT consultant on probably the biggest website development in Europe, the merge of literally hundreds of diverse European Commission websites into one coherent site. I also trained in linguistics. Not just at a regular University course, but with SIL, the world's elite linguists. These are the people who wrote the Ethnologue, the definitive guide to the world's languages. The linguistics training course taught us how to be linguistic special forces. We learnt how to go into any language area in the world, and without any classes, language books, dictionary or anything, to learn to speak the language just by talking with native speakers. It was this one-on-one method I was using to learn Thai, and it was this one-on-one language experience which I thought I would like to automate. This was the beginning of Lingopolo. I now work as the full-time Founder of Lingopolo, seeking to bring about the vision that everyone should have access to quality language education, the ability to learn any language, from any language, for free. The picture shows me in 2013 in an actual lesson with Khruu Aun. All you really need to know is the simplified answer which is in the "What do the levels mean for the words in a lesson?". So make sure you've read that before reading on here. What follows is a very geeky answer, so you can stop now unless you're really interested to know all the geeky detail. A card is the term given for a word or phrase in the context of moving through the system of boxes. All cards start off as "unstarted". This is like a box of unlimited size labelled "unstarted". This starting box can even be thought of as box zero (indeed in the program it is implemented as box 0), but the website calls it "unstarted cards" which is hopefully a little less intimidating. There are 10 other boxes labelled from box 1 to box 10. Each box has a target maximum number of cards which the box can contain. As the levels get higher, the maximum number of cards get greater. This, together with the other rules below, ensures that as cards go up the levels they are asked less and less often. Starting from box 1 and moving up to box 10, is the box full? If so, take the front card in the box. If no card has yet been selected from any of the 10 boxes (because none was full), and if there are any cards in the "unstarted" box, take one at random from there, place it at the back of box 1, and repeat this selection process (box 1 may now be full). 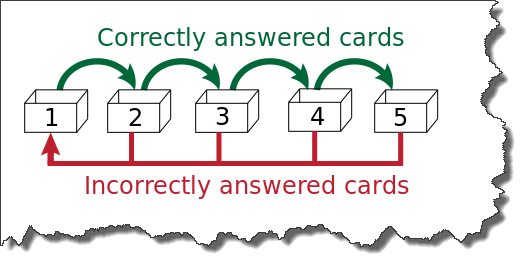 If none of the boxes 1 to 10 are full, and there are no cards in the "unstarted" box, select the card which has not been asked for the longest period of time compared with all the other cards in these boxes.